According to a study by Guidance and Synovate, more than 60% of online shoppers are drawn to web sites that offer a dynamic customer experience and over 35% of those surveyed said they are more likely to return an online store that offers customer testimonials and and product reviews. Another study found that a large number of those who like customer reviews (customer reviews are also referred to as product reviews) are more likely to buy from sites that posts negative reviews as well, not just positive ones. The graph below is from an actual Yahoo Store. 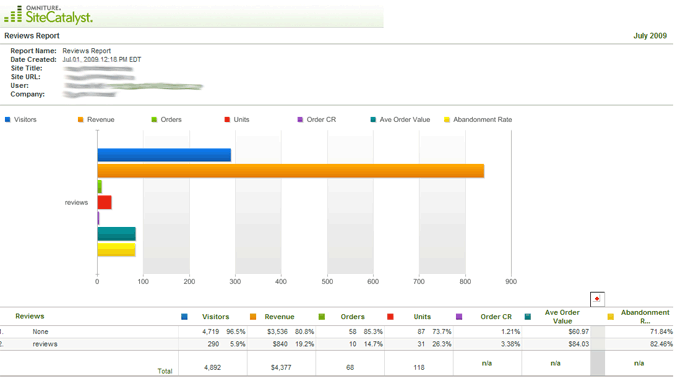 It shows a conversion rate change from 1.21% to 3.38% between items that don't have customer reviews vs. those that do. How many times did you buy a book on Amazon and checked out what others wrote about it? Shouldn't reading what the publisher says be enough? Why do we trust people we don't know at all? According to all these studies, what it comes down to is people distrust companies but listen to one another. With customer reviews, you as a shopper can find out what others like you think about the product, and not what the publisher wants you to think. And, if you allow negative reviews to be posted as well, it increases the trust in your store. With our Customer Reviews feature for Yahoo! Stores, you can let your customers rate your Yahoo! store's products and post reviews about them. Fully functional, self-maintaining (no need to receive the reviews and post them yourself to your store). Works seamlessly with any editor-based Yahoo! Store (requires php/mysql-enabled web hosting such as Yahoo! Merchant Solutions. If your store is legacy store or need outside hosting, you'll need to have access to or obtain third party hosting from www.godaddy.com for example). Your store's customers automatically receive an email a few days or weeks (configurable by you) after their purchase to remind them to leave feedback. When someone posts a product review, you receive an email with the review. The email contains two hyperlinks, one to accept the post and another to reject it. 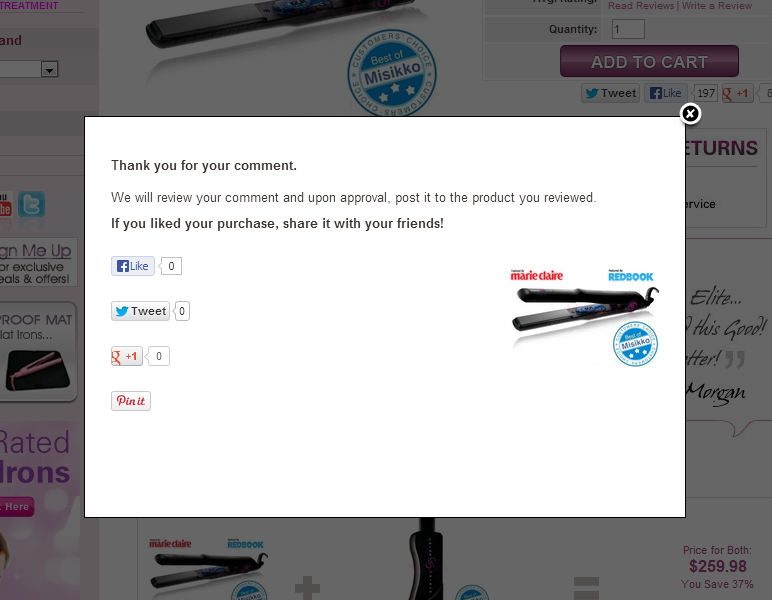 Reviews are only posted after you approve the review by clicking the "Accept" link in the automated email. Also included is a full-featured, password-protected admin interface to manage the reviews. You can approve or discard reviews or make changes (for example fixing language errors, etc.) Through the admin interface you can also customize the email that gets sent out to those who purchased something from your store to remind them to write a review. Rich Snippets - Our customer reviews are marked up with rich snippets meta data. This information may be used by the search engines but only if the rest of your product pages also include rich snippets. If you don't yet have rich snippets, this might be a good time to have them installed as well. Click here to read more about rich snippets. Social Media - Our reviews system makes it easy for your customers to share their reviews with their friends on social media networks. When someone leaves a review, on the "thank you" page they will are presented with buttons to share their experiences on Facebook, Twitter, Google+ and Pinterest. Your store must already use customized templates. If your store uses the built-in Yahoo templates, we can convert your store to custom templates for an additional fee (see here for more information.). Is this a search engine-friendly product? 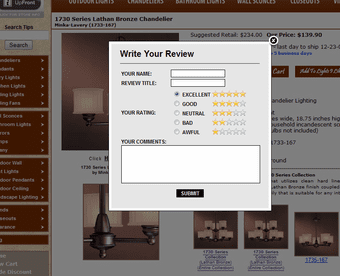 If your store has Catalog Manager enabled, then every time you approve a review, that review is automatically inserted into your store editor, so when you next publish your store, the approved review will go live as part of the HTML source of the page so the search engines can read and index it. If I want the search engines to see the reviews, are the reviews posted to the product page as soon as I approve them? If you have Catalog Manager enabled in your store, then yes, as soon as you approve a review it is posted to the corresponding product page, and will go live the next time you publish your store. If you don't have Catalog Manager, then you either let the scripts take care of it in fully automatic mode, or, if you start posting the HTML into the reviews-html field, then you will have to do it every time a new review is posted to that product. Are there recurring monthly charges? No. We only charge a one time fee to set up and configure customer reviews, once it's done, there are no additional charges. This is a great product that bolts onto your existing Yahoo Store. Many review packages charge a monthly fee but this one is a one time cost and you enjoy the benefits for years to come. I also like the automatic emails it sends to customers asking for a review. To me this is a key feature to actually engage customers to review your products. 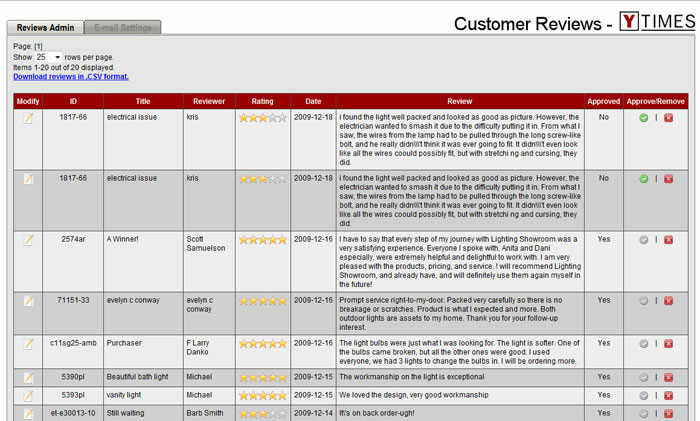 Istvan did a great job integrating these reviews into our site. There were a couple initial snags but Istvan was able to quickly correct any problems. I seldom endorse products OR Yahoo! Store developers, but I'll endorse Istvan **AND** his awesome reviews package. This is one of the best $$$ I have spent on my Yahoo! Store in the past 14 years. For example, yesterday, I got around 200 reviews which contained over 15,000 words of unique content for one of my Yahoo! Stores. I also was able to save some customers who had problems that I never would have known about had I not asked THEM for a review. If you have a Yahoo! Store and you DON'T have these reviews, you are leaving THOUSANDS of dollars on the table. "Studies show" products with reviews convert at DOUBLE DIGIT rates higher than products without reviews. Your mileage may vary, but if you're like any of MY stores, you'll make more with these on your Yahoo! Store. We are thrilled with the Product Reviews module from Y Times. The reviews were installed seamlessly into our existing website design. 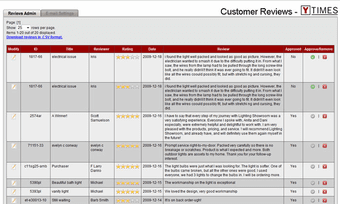 Our customers have found the review form to be easy to understand and complete. 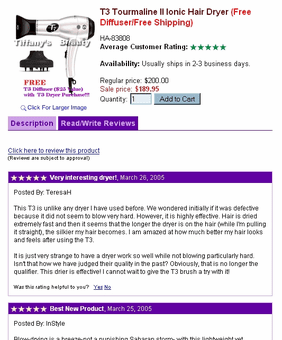 The Y Times Product Reviews are much more economical than other Product Review services. With Y Times the cost is $750 plus $9.95 per month to host our reviews (this is paid to a third party web host.) Other services we looked at would have been $300 to install plus a recurring $40 per month fee. Thank you Y Times for a great product!